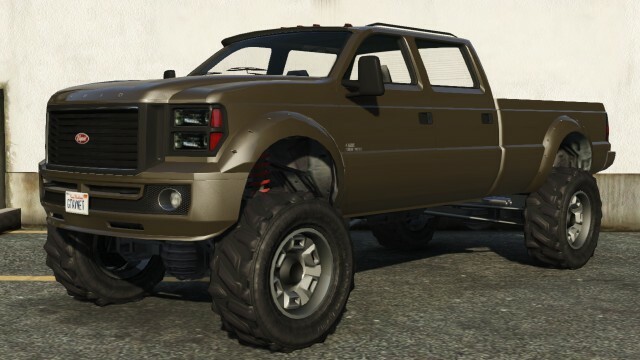 The Vapid Sandking XL is an off-road oriented pickup truck in GTA 5. 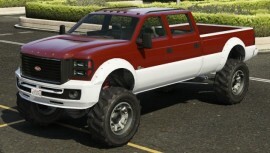 It is based on the 2008-2010 Ford F-250 Super Duty with influences from the 2010-2014 Ford F-150 SVT Raptor. The ‘XL’ (for “extra long”) model has a full-sized 4-door crew cab, making the Sandking XL longer than the Sandking SWB variant. 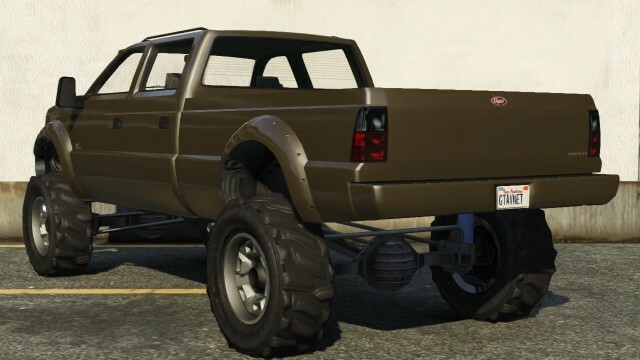 The Sandking’s off-road wheels are the largest of any mod-able vehicle in the game. When switching to another wheel type, the new wheels will be ‘stretched’ to fit the Sandking’s original wheel size. This can make for some striking or weird-looking wheel options. The Sandking XL has a high amount of ground clearance. The inline-6 turbodiesel provides it with good power and torque, allowing it to get over obstacles easily. A known glitch or design flaw in the game was that the truck did not feature full 4WD, so offroad traction on steep hills was limited. 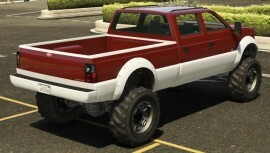 However, as of update 1.08, the truck now features fully functional 4WD, so it is now an extremely capable off-roader. 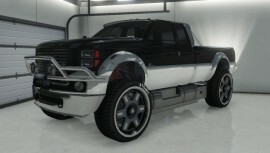 In game, it acts almost like a monster truck and with proper speed the player can drive right over most low-profile cars. The Sandking XL has poor handling on the roads, offering fairly low levels of grip, due to the truck’s heavy body. Off-road, the truck handles better, but the heavy weight of the truck and its long wheelbase contribute to its handling not being the best of the off-roaders, although suspension upgrades can make a noticeable difference. The short-wheelbase version has slightly better acceleration and better handling, making it the more desirable variant. Like the Rebel and other off-road vehicles, however, its exposed tires make an easy target to be shot, unless it is fitted with bulletproof tires. You can find Sandking XL east from Del Perro pier, at the sand beach nearby. More correctly it is at Vespucci Beach by the Fairground rides right beside the Del Perro dock. A Sandking XL spawns in front of the player after he has stolen the Cargobob for The Merryweather Heist in the offshore option.